The head of a union that represents some of the workers in the judicial branch of state government says he is “extremely disappointed” the chief justice didn’t consult with the union before announcing layoffs. 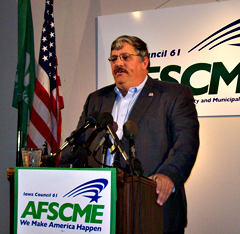 AFSCME members in the executive branch are voting later this month on a plan that will see all workers take five unpaid days off as a way to save money — and prevent layoffs. Danny Homan, president AFSCME Council 61, says AFSCME members who work in the court system had been emailing him, suggesting they might be willing to do the same thing. According to Homan, the purpose for a union is to give workers “a voice in their own destiny” and he says that didn’t happen in this instance. Over 100 state workers in the court system are being laid off, plus others who remain on the job in the judicial branch will be required to take 10 unpaid furlough days. The state budget picture may be dim in the coming year as well and Homan says he hopes the court’s administrators look for “other solutions” to avoid layoffs in the future.